This is a toroidal ring of seven ordinary saddles. It represents the first collaborative effort between Brent Collins and Carlo H. Séquin. It originally was composed of 1428 biquadratic Bezier patches which were represented by a total of 172032 triangles. 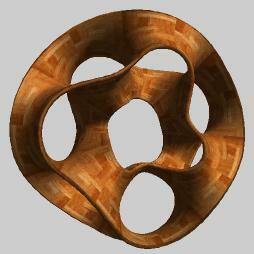 This shape was then simplified and optimized by Hugues Hoppe into a shape with only 10,000 triangles. 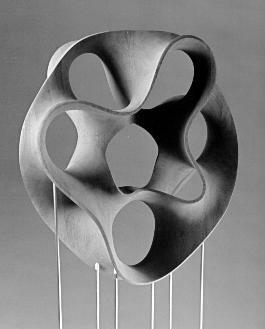 The scale or strength of this model is not critical; it can be scaled so as to fit optimally a particular process or some remaining space in a run of a larger piece. The STL file describes a part with a diameter (in x) of 81,000 units and a thickness (in y) of 34,000 units. The surface walls are 3000 units thick. Thus when the units are interpreted to mean one to two micro-meters, we would get parts of a reasonable size. Orientation is not critical either. However, for a layered manufacturing process (SLA, SLS, etc), it might be best to turn the object 90 degrees around the x-axis, thereby giving the part minimal height. hhh10000.stl.gz : Mid-resolution version with 10,000 triangular faces (0.52 MB).